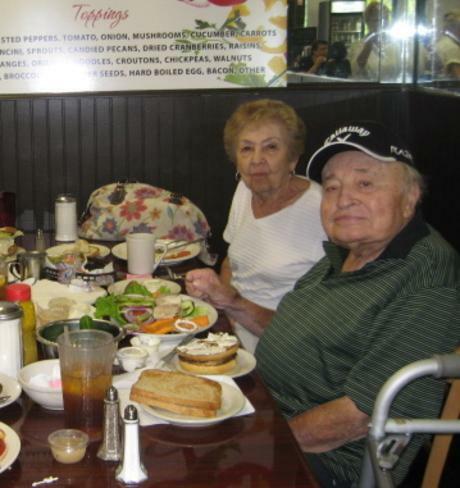 The author’s grandparents, Bubbe and Zayde, eating a pork-free lunch at Bagel Land. The first bite was pure saline crunch. The next meaty mouthful packed an earthy complexity, rounded by sweet richness, which liquefied and pervaded my palate. Grease lubricated my lips, so I licked them for seconds. Bacon, its fat rendered me a woman obsessed. It was my first time eating chazer (pig) and already I knew the consummate vehicle for “swinesicle” consumption is the BLT.The bacon’s salt seasons the tomato, its drippings dress the lettuce, and the mayonnaise mortars the meat to the toast. Bread makes the pork portable and carb-craving quenching. It is exquisite and seemed just the thing for my introduction to the other white meat. My parents raised me kosher, restricted to hekshered (kosher-certified) groceries and two sets of dishes at home and to pescetarianism in restaurants. My brothers and I watched in jealous horror as our secular cousins chomped down on soggy bacon at family brunch. We all had broken kashrut secretly, a milk chocolate bar after lamb chops here, a Chicken McNugget there. But it had been imprinted on our souls: Jews do not eat pork. Its treifkeit (unkosherness) trumps that of all other possible combinations of prohibited foods. We don’t know why exactly, but some mystical property of pork makes it taste more transgressive and feel more non-kosher than anything else. To this day, I may dip bacon in milk like a cookie or wrap my cantaloupe in prosciutto like a pro, but I will neither order nor prepare pork chops. Maybe it’s the word “pork.” Just doesn’t sit right. Which is why I was so surprised when my bubbe(grandmother) recently divulged she used to fry hog all the time. After sojourning in Cuba between the Second World War and his US immigration, myzayde (grandfather) developed a taste for ham, cheese, and pickle sandwiches. So Bubbe fixed Cuban cuisine for lunch and beef borscht with kasha for dinner. Having escaped a childhood in Ukrainian DP camps, Bubbe took pride in the American normalcy of the whole pork-eating affair. Since she and Zayde expressed no shame or reservations about indulging in chazer and, since my pepperoni pizza-eating peers had been pressuring me for years, I decided to try it. I started with a BLT, just like Dad did. My bacon cherry popped, I don’t think I can go back to a life without the forbidden fruit (baby back ribs count toward my three-to-five servings a day, right?). I’m not sure my children will grow up in a kosher home like I did, but I think that’s okay. They say religiosity skips a generation. The same cannot be said, however, for baconlust.